Focused on the Live Show skills of the Headshots. Of course, Live Shows are what really laid the foundation for the crew. That didn’t start with the national tours of Atmosphere, even on the home-front, in the early days of the crew, there was a strong focus on ripping shows live! Various members of the crew are heard representing on 3 different live segments. 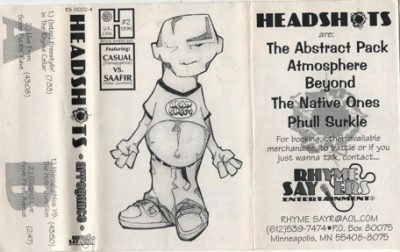 The tape artwork also official lists the Headshots crew, alphabetically, as The Abstract Pack, Atmosphere, Beyond, The Native Ones, & Phull Surkle. I also love amongst the bizness in the cover you can not only hit them up for booking or merchandise, but the option is also given to hit them up if you wanna battle…nice! The first track is listed as “Freestylin’ In The Rhyme Cellar” and Produced by S.T.R.E.S.S Tha Hip Hop EmPHATic and featuring Atmosphere, Beyond & Knowledge MC of Abstract Pack. The next track is the main part of the tape, simply titled “Live From Some Fu**in’ Rave” and it’s 43 Minutes of the Headshots rocking in Stillwater, MN in December of ’95. The set features tracks produced by ANT, D Spawn, and DJ Trix, with MCing from Beyond, Atmosphere, Abstract Pack, & Phull Surkle. The tape comes to a close with a quick portion of The Native Ones (a.k.a Los Nativos) setting the vibe at First Avenue. comment "Headshots – Arrogance: Vol. 2 (Cassette) (1996) (320 kbps)"